May you choose outrageous actions that challenge who you are and encourage who you are becoming. May you take one step, however small, toward that which you have always longed for. May you recognize the unique and powerful contribution that you bring to the people whose lives you touch. May you be as wonderful as you really are, and do things because you want to, not just because you should. artist with a unique vision that no one else has. chaos while remaining aware of the unrest in the world. you awake to the miracles available all around you. and bring you great teachers to awaken your understanding. them with qualities like freedom, integrity and self-nurturing. of the world when the time is ripe for you to release them. by someone who can see who you really are. May your body speak to you and teach you how to care for the temple that houses your bright spirit. May you walk gently on the earth and honor your hearth and family with your action and your rest. May you find and enjoy the fruit of abundance so that your life path can be fortified and furthered. May you embrace the Tree of Life and be informed by the wisdom and she brings to those on her path. May LOVE be at the center of all your choices and may you, with me, send this blessing to all beings. Blessings dear one for your twenty-ten. Let us proceed in outrageous faith and hope! Robin Mallery is passionate about food! 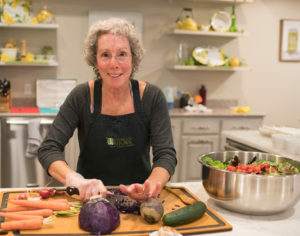 Starting from where and how it's grown, to how far that food travels to the dinner table, to how it is prepared and savored...Robin blends shopping, cooking, and eating tips with her unique Kitchen Zen and mindful meals approach to enjoying real food. While you are waiting for her to finish the upcoming book, "Kitchen Zen: The Journey to Nourish Body and Soul in Our Changing World", you can find Robin's sporadic blog posts here or on FaceBook. "There aren't many people with your combination of medical expertise and caring for the whole person. Your incremental approach to helping me develop better health habits really works. I never feel judged and always feel encouraged and cared about. Thank you!"